A total of 3 reviews for Evicthem.co.uk have been written yet. The most recent reviews are listed below. 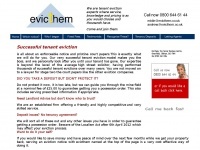 Evicthem was recommended to me and I have been extremely satisfied with their service. Andrew has always been very approachable and has been with me every step of the way. He has provided excellent support and professional advice, giving us reassurance at every stage in the face of a very difficult tenant eviction which has now been successfully achieved. I couldn’t have done it without him and I can highly recommend them. I am happy with Andrew's response and approachability. He is always handy and happy to help. Few times, I spoke to him on the late evening and weekends due to a nuisance tenant and Andrew was always provided me his expert advise and help. I would definitely recommend him.